in the immediate vacinity of the South African parliament. 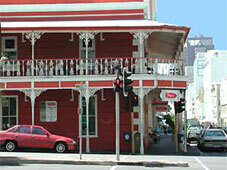 The victorian style building was recently completely renovated for R500 000. An additional floor is currently being developed. Above the restaurant on the first floor there are 120 seats available. This is ideal for all kind of functions such as conferences, concerts, workshops and seminars. The modern high quality and comercial kitchen is included in the price. The offer comes with a liquor licence. Overall area: 254 m² - Total size of building ca. 500 m² with ca. 75 m² balcony. Thereof: Groundfloor: ca. 100 m² restaurant (incl. stage for all kinds of functions) and a 60 m² bar, kitchen, storage room, as well as 3 toilets. dancing clubs, workshops, seminars etc ... with direct access to the balcony. Seats for ca. 120 persons. 2nd floor: Suitable for development - contact us for detailed development plans!